Our nation is torn between two societies – the upper class people with strong proficiency in English and the other is the lower class community with minimal education and a weak hold over English language. God knows how much struggle our patriots had to put to drive away the Britishers from India. Though the Britishers left our nation, but their presence is still felt when a high-class corporate official treats a minimally educated worker harshly. Even during matchmaking, a girl will always prefer a highly qualified, fluently english speaking boy than choosing a boy whose english speaking abilities are of mediocre level. For the first time, Chetan Bhagat has picked up a topic on such scenario where Madhav Jha, a Bihari boy falls for Riya Somani, a girl from aristocratic family based in Delhi. The story begins with Madhav meeting Chetan Bhagat at a hotel, requesting him to read the letters of his girlfriend Riya Somani who has passed away. Though Chetan is reluctant to read the letter of a dead person, but finally makes up his mind to read the letters. The letter takes him to the story of Riya and Madhav Jha. Though Riya considers him as his best friend, but refuses to reciprocate to the feelings of Madhav Jha. In the first pages of the novel, Madhav Jha is projected as lecherous, lusty Bihari boy who has one only thing in mind for Riya. Later Riya gets married to a rich guy while Madhav moves to Bihar to take care of the school which is desperate need for funds. As Madhav returns to his hometown, he is a changed man, eager to make his school a recognized school with all the facilities required for students – electricity, classrooms, books, boards. Destiny brings him close to his dreams and a support comes to him in form of Bill Gates foundation who are ready to give monetary support to his school. The only hurdle that he has to cross is to communicate fluently in english and convince the foundation to offer him funds. Life brings Madhav to square one where he again meets Riya who is now a divorcee. Riya patches up her differences and helps Madhav in his english speaking. 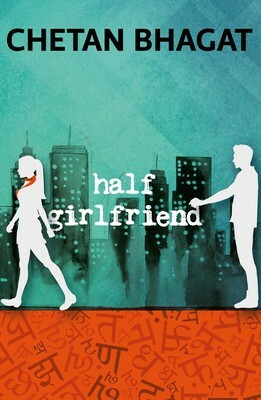 How Madhav succeeds in bagging the funds and wins back his love Riya, the rest of the story is best to be read in the book ‘Half Girlfriend’ written by Chetan Bhagat. The story is very engrossing and interesting as so are the characters – Riya Somani and Madhav Jha. This is the first book of Chetan Bhagat which was adapated for a Bollywood movie even before its release in bookstores. Thanks to lots of hypes and heavy-duty marketing, ‘Half Girlfriend’ succeeded in winning the hearts of readers. If you are keen to win the heart of your ‘half girlfriend’ then this book is there to boost your spirits.